Dr. Castellanos received his medical degree from the National University of Honduras. He then completed his residency in Internal Medicine and a Fellowship in Pulmonary and Critical Care Medicine at The University of Massachusetts Medical School. He is the Medical Director of the Department of Respiratory Therapy and Pulmonary Function Lab for UMass Memorial HealthAlliance Hospital. 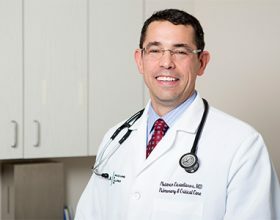 Dr. Castellanos is board certified in Internal Medicine, Pulmonary Disease and Critical Care Medicine. His areas of interest include Interstitial Lung disease, Bronchiectasis, Interventional Pulmonology and Thoracic Oncology. He lives in Holden with his wife Claudia Castellanos and his three children Plutarco, Ana Maria and Federico Andres. Dr. Castellanos is fluent in Spanish.